When he was 7 years old Christopher Nolan went to see 2001: A Space Odyssey with his father at the Odeon West End cinema. And 46 years later here he is back in that same cinema standing in front of us. This time on stage introducing us to his own sci-fi film - Interstellar. And courtesy of the lovely Marcus Tustin I'm here too at the European premier for Bafta in London's glitzy West End. 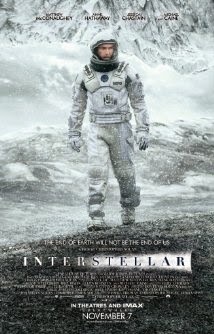 Starring Matthew McConaughey, Anne Hathaway, Jessica Chastain, and Michael Caine the film is a cross between Armageddon, Gravity and 2001: A Space Odyssey. And when I say 'cross' I mean it's actually all three of those films bolted together - not the best bits of each distilled down into one film. This film is long. And at just shy of three hours it's over-long to be honest by a good hour or more. But it's obviously been a labour of love for writer/director/producer Christopher Nolan and his co-writing brother Jonathan Nolan and there is much to admire here. The acting is great, the special visual effects are super and the plot twists suitably twisty (if a little too well sign-posted). And sure the techno-babble gets a bit clunky at times and some of the plot holes are more massive than the final third's deus ex machina Black Hole but all in all it's great film. Ambitious, exciting and a good watch. Dinner party review: Good, but not as good as 2001.